Leading a successful business means knowing the market, understanding product trends, hiring the right people, enabling those people, staying on top of expenses, making the right investments and countless other responsibilities. One area you may or may not have on your mind is compensation. In today’s tight talent market and ever-increasing competition spurred by technology, the web and globalization, getting compensation right is more important than ever. It impacts recruiting and retention, sure, but it also affects company culture and even your bottom line. It has legal implications, too. With the changing demographics (and expectations) of the current workforce, plus automation opportunities today’s software provides, it’s time to modernize your organization’s compensation. 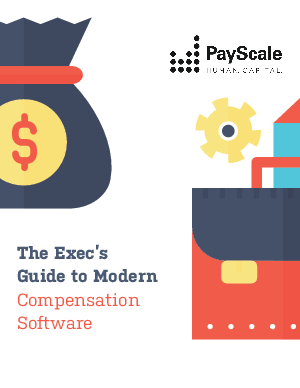 In this guide, we’ll share in detail the reasons you should make modernizing your comp a priority, the value and ROI of implementing modern compensation software and specifically how PayScale’s modern comp solutions work.